What happens when you take an independently wealthy man with no job experience and a love of classic detective movies? 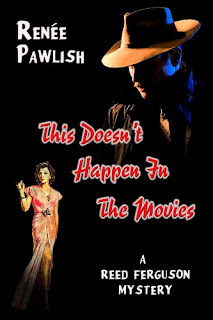 You get Reed Ferguson in This Doesn't Happen in the Movies by Renee Pawlish. Reed is in his early thirties and although he was educated to be an attorney, he has never kept a job for long. It doesn't help that he has just enough inheritance monies that he doesn't really need to work. Reed is also an avid classic noir detective movie fan. After helping his father's friend with a small investigation he decides to hang his shingle and open a private detective office. It helps that in Colorado one isn't required to be licensed. What would any classic detective movie be without the endangered femme fatale? Enter Amanda Ghering with a sob story about her missing husband. Quickly Reed learns that life doesn't mimic the film arts and he acknowledges he doesn't have a clue about what he's doing. He also quickly learns that Amanda has lied to him and there is a lot more to her "missing husband" story than initially thought. A cat-and-mouse game quickly follows between Reed, Amanda, the faux FBI, the real FBI and the nefarious and a secretive group known as the X Women. In a lot of ways this is a coming-of-age story mixed with a mystery and filled with dark humor. Reed has never had to grow up and assume much responsibility, but now he becomes responsible for the lives of a friend, his family, and his client as well as himself. This Doesn't Happen in the Movies isn't a typical mystery/detective story and that makes it rather refreshing. It is precisely because Reed doesn't know what he's doing, makes several mistakes along the way, but grows as an individual and professional that made me want to continue reading to see what's going to happen next. I laughed, I cringed and I enjoyed this fast-paced mystery. I look forward to reading more about Reed Ferguson's shenanigans in the future. This Doesn't Happen in the Movies is available as an ebook from Smashwords and Amazon. Thanks for the lovely review! It's nice when people enjoy the ramblings we authors create.